Over the course of the next two-plus weeks, we’ll discuss ten players that might become the most interesting men in the Huskers’ locker room. (Remember those Dos Equis commercials with the OG Most Interesting Man in the World? Those were great. Much better than the new ones. They even changed the slogan!) Sorry, let’s get to it. Daniels is the only member of our list that was on a college football team last season but didn’t play (spoiler alert… I guess). With that comes a little bit different insight. Daniels had to sit and watch guys he committed to and guys he worked with day in and day out get, for lack of a better phrase, slapped around last year. That’s hard. If you make it to the Division I level of college football, there’s almost always an “I can move the needle and help my team” mindset. 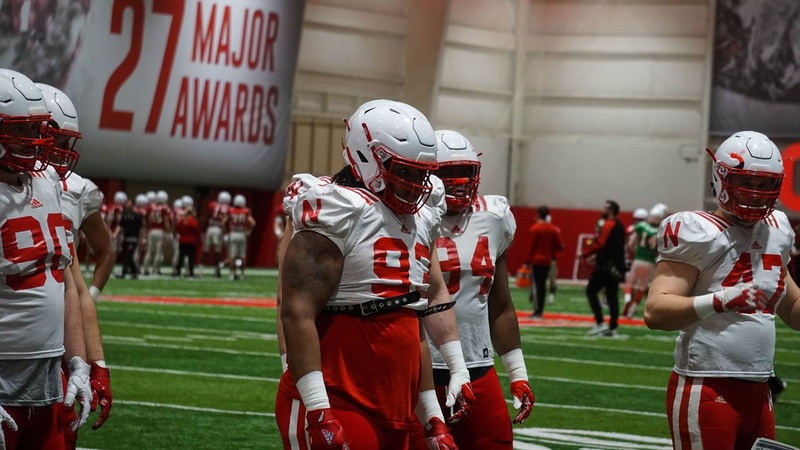 For the 6-foot-3, 325-pound defensive lineman (his words, different from his huskers.com profile), he might have thought that but he couldn’t do anything to actually help. He can this year. That alone makes the former three-star recruit a person of interest heading into the season. The Husker coaching staff was plenty complimentary of Daniels throughout the spring but he is still young. There's plenty of room for him to grow. We got an extended look at his play in the Red-White game on April 21 — repping with the White team — thanks to the absence of senior Mick Stoltenberg. (Stoltenberg’s injury was largely downplayed initially by the coaching staff, but he missed multiple weeks and the actual injury might have been worse than what was let on.) As long as Stoltenberg is healthy this season, Daniels might be in a serious battle for playing time. The Davis twins — Khalil and Carlos — and Peyton Newell all took snaps at nose tackle in the spring game. Deontre Thomas, primarily a nose during his freshman year, moved outside for the scrimmage; the Davis twins also played outside. Daniels won’t be doing that, not at his size. If he plays, it’ll be in the middle where he’s tasked with eating up blocks and clogging holes. Thankfully, that’s not a bad role for a 300-pound guy that has added muscle since his arrival on campus last year. Daniels wasn’t a standout in the scrimmage, finishing with only three tackles, but he made a couple plays that flashed his potential as a legit two-deep guy once the fall rolls around. Maybe this play doesn’t end as poorly if quarterback Tristan Gebbia doesn’t bobble the snap, who knows. That being said, even if that handoff goes to tailback Wyatt Mazour, look at how much pushback Daniels has already gotten. That play has been altered. The ball-carrier has to bounce it outside. Here's another. Talk about blowing up a play. Quarterback Adrian Martinez picks up good yardage here but that’s not on Daniels. This was a designed pass and Daniels made sure Martinez had no time to get into it. There was a stretch in the second quarter, a drive for the Red team, where Daniels was in for most of the beginning parts. Each run was toward the perimeter, away from Daniels, with varying degrees of success. Daniels left the field and the Red team immediately ran up the middle for a first down. It wasn’t an isolated incident either. When Daniels was replaced on the defensive line throughout the game, there were noticeable holes in the middle of the line of scrimmage for Red team backs to run through. The problem for the freshman will, unsurprisingly, be consistency. For each good moment on tape, there was a mistake or a moment you watch and say, “Well, he should have filled this gap or done this differently.” We’re talking about a backup here, though, not a relied-upon starter. Daniels isn’t the most nimble of players but he’s got really good strength. He’s got a frame Nebraska doesn’t currently have on the defensive side of the ball outside of Stoltenberg. Daniels said before the spring game he wants to be an every-down guy this fall. Carlos Davis, said that strength is what will give him the chance to do so. “[He] understands his strength and what he can do with his frame,” Davis said. Well, let’s see how that translates to the field this fall. Color me intrigued.